I believe within the past day or two they redirected NH to the KBO 2014 MU69 they intend to do a flyby of in or around New Years Day 2019. This thread could end up being one of the longest running one in a net history. Can't wait to see a KBO. Will be very interesting to see what sort of variety they have to offer. Now we have some really comprehensive analysis of the New Horizons Pluto flyby. The earlier stuff was just an amuse-bouche! ...this week, in the journal Science, New Horizons scientists published the first comprehensive set of papers describing results from last summer's Pluto system flyby. "These five detailed papers completely transform our view of Pluto – revealing the former 'astronomer's planet' to be a real world with diverse and active geology, exotic surface chemistry, a complex atmosphere, puzzling interaction with the sun and an intriguing system of small moons," said Alan Stern, New Horizons principal investigator from Southwest Research Institute, Boulder, Colorado. 1) Age-dating of Pluto's surface through crater counts has revealed that Pluto has been geologically active throughout the past 4 billion years. Further, the surface of Pluto's informally named Sputnik Planum, a massive ice plain larger than Texas, is devoid of any detectable craters and estimated to be geologically young – no more than 10 million years old. 2) Pluto's moon Charon has been discovered to have an ancient surface. As an example, the great equatorial expanse of smooth plains on Charon informally named Vulcan Planum (home of the "moated mountains" informally named Kubrick and Clarke Mons) is likely a vast cryovolcanic flow or flows that erupted onto Charon's surface about 4 billion years ago. These flows are likely related to the freezing of an internal ocean that globally ruptured Charon's crust. 3) The distribution of compositional units on Pluto's surface – from nitrogen-rich, to methane-rich, to water-rich – has been found to be surprisingly complex, creating puzzles for understanding Pluto's climate and geologic history. The strong differences found in surface composition from place to place on Pluto are unprecedented elsewhere in the outer solar system. 4) Pluto's upper atmospheric temperature has been found to be much colder (by about 70 degrees Fahrenheit) than had been thought from Earth-based studies, with important implications for its atmospheric escape rate. Why the atmosphere is colder is a mystery. 5) Composition profiles for numerous important species in Pluto's atmosphere (including molecular nitrogen, methane, acetylene, ethylene and ethane) have been measured as a function of altitude for the first time. 6) Also for the first time, a plausible mechanism for forming Pluto's atmospheric haze layers has been found; this mechanism involves the concentration of haze particles by atmospheric buoyancy waves (called "gravity waves" by atmospheric scientists), created by winds blowing over Pluto's mountainous topography. 7) Before the flyby, the presence of Pluto's four small moons raised concerns about debris hazards in the system. But the Venetia Burney Student Dust Counter only counted a single dust particle within 5 days of the flyby. This is similar to the density of dust particles in free space in the outer solar system – about 6 particles per cubic mile – showing that the region around Pluto is in fact not filled with debris. 8) New Horizons' charged-particle instruments revealed that the interaction region between the solar wind and Pluto's atmosphere is confined on the dayside of Pluto to within 6 Pluto radii, about 4,500 miles (7,000 kilometers). This is much smaller than expected before the flyby, and is likely due to the reduced atmospheric escape rate found from modeling of ultraviolet atmospheric occultation data. 9) The high albedos (reflectiveness) of Pluto's small satellites are entirely different from the much lower albedos of the small bodies in the general Kuiper Belt population (which range from about 5 to 20 percent). This difference lends further support to the idea that these satellites were not captured from the general Kuiper Belt population, but instead formed by agglomeration in a disk of material produced in the aftermath of the giant collision that created the entire Pluto satellite system. Nice. This will give scientists decades to work on. More than 15 months after NASA’s New Horizons spacecraft flew past Pluto, the last bit of data captured during the flyby has finally been transmitted back to Earth. NASA said the final transmission was a digital segment of an observation sequence captured by New Horizons’ Ralph/LEISA imager, focusing on Pluto and its biggest moon, Charon. The readings were stored up on July 14, 2015, as the piano-sized probe zoomed past Pluto about 3 billion miles from Earth. Since then, New Horizons’ distance from Earth has grown to 3.4 billion miles. The downlink took place at 2:48 a.m. PT Tuesday via NASA’s Deep Space Network station in Canberra, Australia. In all, more than 50 gigabits of data relating to Pluto and its moons have been transmitted back to Earth. According to the plan in the 1st of January is expected a flyby of Ultima Thule . Does anyone knows if it´s going to be broadcasted? Nothing to broadcast. They'll know the spacecraft is alive then, but it will take months to get all the data back. At that distance, it's a very low data transmission rate. They'll probably have a few low resolution photos a day or so after the encounter. Sorry but the distance has nothing to do with the transmission data rate. The signal from the New Horizons spacecraft will take about 6 hours one way, compared to 4 hours and 25 minutes during the Pluto flyby. The photos will not be of a lower resolution. Yes it will take months to get all the data but not really much longer than it did from the Pluto flyby. Sorry but the distance has nothing to do with the transmission data rate. .
Of course it does. Longer distance, weaker signal = lower data rate. This is three years further out and it would appear, reporting is somewhat conflicting, about half the rate at Pluto. It is amazing that we can even communicate, New Horizons antenna transmits with 12 watts of power and the signal it receives from Earth is somewhere around a millionth of a billionth of a watt by the time it gets out there. The data rate for Pluto was 1 to 2 Kbps. And NH is now nearly 50% further out and its RTG power is now at ~190W (down from 245 at launch and 202 during it's Pluto encounter). yes I know there won´t be a broadcast I was thinking in the photos. Ok, let´s wait for January 2nd!! The weaker signal is due more to the power output of the the RTG which decreases it's power output at about 5% per year. Say what? Power decreses to the 2nd power of distance. Power loss comes on top of that but NH has plenty power to run the transmitter at 100%. Yes, the issue the reduced RTG power presents is how many other systems can be run simultaneously with the transmitter? The the imaging systems, along with the other sensing systems, the image processing and data crunching, along with everything else (nav, temp control, basic operating needs) must be balanced against now adding the 12W for transmitting many hours a day at just 1-2kbps (and don't forget for data integrity over that distance the amount of duplicate data will increase). 30W here, 20W there, all needing to run to perform the required tasks or produce the needed information, it all adds up. It is truly wondrous what the New Horizons team manages, the science it can produce. Not really... No movable platform, so there isn't much science you can do while pointing the transmission antenna towards earth. So it is just transmitter, control system + perhaps some heating to supply with power. Incorrect. They do move the platform to make the observations then reorient to aim the antenna. Not significant movement but what provides the best data versus fuel use. They have to do it anyway when they pass a mass as it affects trajectory and antenna orientation anyway. Moving the platform and moving platform are different things however. Voyager had a moving platform, and could do science and transmit that the same time, NH moves the whole platform (aka the whole probe) and can't to that. Hence the transmitter will pretty much always have 100% Power. Incorrect. I know the difference. NH moves the whole platform. It rotates itself using its thrusters. It doesn't move much by what most people might think, but it does. And is regularly reorienting itself to realign its antenna so its is properly targeting earth. The team must balance the best science against power and fuel limitations and does so carefully. I have the feeling we are talking about different things. There is not much science going on while transmitting, and no transmission going on during science. No RTG induced limit in transmission power. The only factor reducing data rate is distance, not RTG power or competing science instrumentation. transmission path attenuation is distance squared. that is probably more of a hit that a linear degradation of the power source. Data rate is affected by Signal to Noise Ratio. As you get farther out, the noise stays the same but the signal gets weaker, so the SNR goes down and you have to use lower data rates. The RTG isn't losing 5% a year. That was an oft quoted study comparing new RTGs they're working on to old ones, but the degradation rate didn't take recent improvements into account. New Horizons degrade much slower than Voyagers did. Decent article but I am attaching for the pictures. Doesn't show a lot but it's what New Horizons is seeing and shows it is approaching. The spacecraft will also be pointing its instruments at Ultima Thule, rather than its primary transmitter at Earth, meaning that we'll have to wait for after the flyby to receive any high-resolution images of the object. Exciting times in the vast emptiness of space! Space craft survived the encounter and is healthy. Recorder has science data to transmit. Estimate to transmit all science data: 20 Months. We should have an image in the next few days though. This is truly amazing. Can't wait. Last, pre-encounter, image revealed. 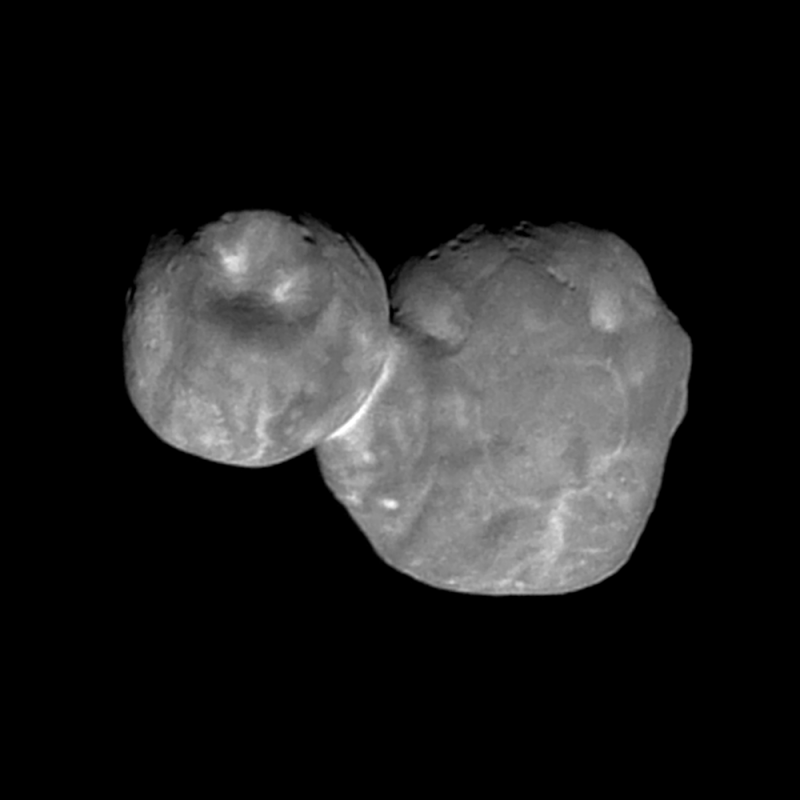 Ultima Thule is bowling pin or peanut shaped. Still not terribly hi res. First encounter images are on the way back now. Should be revealed tomorrow. Best images won't be seen until February. Just watched the conference too, while of course we all cannot wait to see encounter images, really I feel relief it went well. After all, it is the first ever object a probe has gone to that was not even discovered when it was launched, much less conceived as a mission. Congrats to the team truly amazing what they have achieved. Assuming downloads go to plan we will have received images of every aspect of our solar system.ok there are other dwarf planrs out there in 'the belt' but even photographing and surveying one of these objects that go back to the formation of our solar system ( literally frozen in time) is extraordinary. Really look forward to tomorrow.Sounds like they will try and 'meet' another 'piece' if they can before leaving the solar system ( 3rd craft to do so) altogether. 5th! Pioneer 10 & 11 have also left, although we have lost coms with both. Along with you all quite excited to see what turns up! Press conference at 1400 eastern US time will show closeup images. Thing is shaped like a cooked turkey leg. - Ultima Thule is a contact binary. Two objects in contact. Larger object has been named Ultima. Smaller is called Thule. - Shape resembles a snow man. - Eclipse data taken in 2017 very accurately predicted the shape. Our first direct observation of an actual Kuiper belt object (if you don't count Pluto as the innermost). Just incredible. The most distant and the coldest object encountered by a spacecraft. Nice aim NASA, seriously a great job and huge kudos to the whole team! Apparently it hasn't encountered this girl I once knew. want a fly-by or an impact probe? And taken from pretty far away too.... pictures will get 16 times the resolution of this once all data is downloaded. Will they be able to get a good handle on composition? Spectrometer? Photographs are great but not sure how much they tell you about what ( frozen gasses I guess) it's made of. Seriously. We live an an incredible time (and hopefully only to get more incredible). They sent a probe and found ... a potato? The white-ish zone between lobes may turn-out to be mineral-laden-ice. The heat of a very SLOW [walking-speed] collision between similar bodies may have caused the ice to melt on each impact face... allowing the two bodies to fuse solidly together as the water-ice re-solidified in the deep cold. The two-lobe shape of the comet is the result of a gentle, low-velocity collision of two objects. The "terraces", layers of the interior of the comet that have been exposed by partial stripping of outer layers during its existence, are oriented in different directions in the two lobes, indicating that two objects fused to form Churyumov–Gerasimenko.